Non -toxic non-silicone Scar Cream rebuild top layer of skin with human identical lipids. Silicone free non-toxic scar cream works by rebuilding the top layer of skin with skin-identical ceramides and essentail fatty acids. trans dermal technology rebuilds strtum corneum from inside out aimimh at perfect skin regeneration. The ceramides can induce collagenase production, a naturally occurring enzyme that helps digest excess scar tissue. 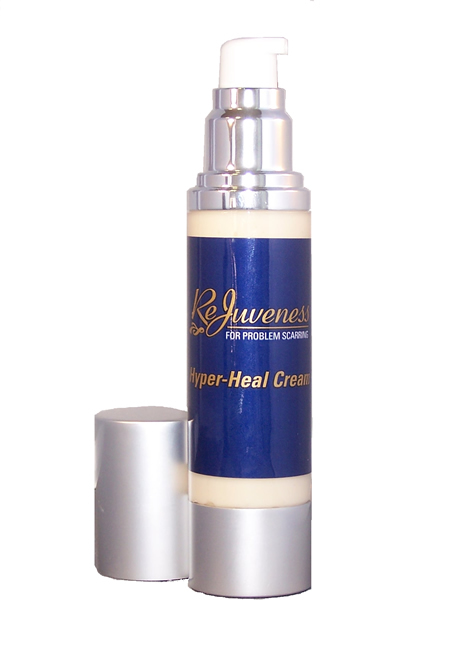 Hyper Heal Scar Cream Restores Skin to It's Normal Texture and Color Permanently (100% Natural Ingredients). Initial Improvement In 1 To 2 Weeks, Average Healing Time Is 1 To 3 Months. 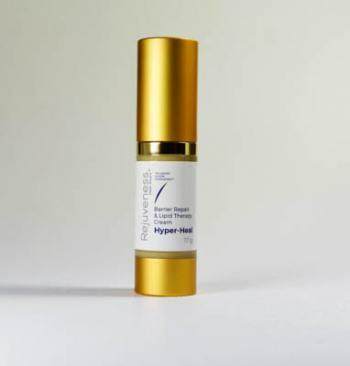 Hyper Heal scar cream is a combination of recent advancements in lipid and transdermal technology. A key ingredient is inolecleic acid within a phytophingisine base that induces collagenase production, the naturally accruing enzyme that digest and eliminates excess scar tissue. The other active ingredients are cermides which have been shown to be an upstream signal transducer for kinase-C cascade which ultimately induces fibroblast and scar tissue reduction. Post surgical patients and clinicians are reporting accelerated healing and in many instances a near scar-less appearance at the lesion site. Patients and clinicians are also reporting and accelerated healing time in keloids with the most dramatic in older more difficult to remedy keloids, often resolved in a month or two. "What could this silicone sheet do to my skin? I thought I would have to live with my tummy tuck scar the rest of my life. I thought of having cosmetic surgery, but the doctors could not guarantee that this extremely expensive procedure would be effective. A friend told me about ReJuveness. What could this little silicone sheet do to my skin? I have been wearing it for a month now and the results are astonishing. My scar is now flattened, has smoothed tremendously, and the color is about back to normal, all this only after a month, it's a miracle, it worked fantastically and has given me my self esteem back! Elizabeth I.". 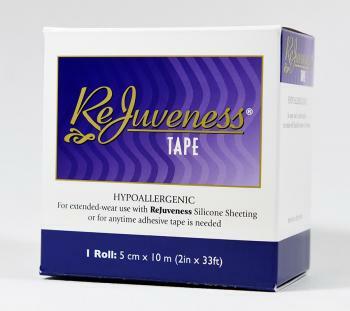 "I saw an ad for ReJuveness Tummy Tuck scar healing",My tummy tuck surgery left me with sore, lumpy, red skin. My Doctor told me it would heal in 3 weeks, after 12 week's it was still very visible. I tried creams and medicated pads, and spent a fortune, but they didn't work, in some cases they made it worse! My Doctor couldn't recommend anything else. I saw an ad for ReJuveness Tummy Tuck scar healing and decided to try it, I had nothing to lose. I noticed a difference in 24 hours! I could see the redness disappearing. It immediately took away the soreness and brought more of a smooth finish to my skin. It actually improved the skin texture where the surgery had left it all bumpy. I've recommended it to friends who have had surgery and my doctor was so impressed he said he is going to recommend it to his patients! Jackie L. Alexandria, VA"
Glycoproteins (Technologically derived fraction which is rich in oligopeptides), Ceramide 3 (Identical human 3-lipid structure), Ceramide IIIB, Ceramide 6 (Identical human 6-lipid structure), Ceramide 1 (Identical human 1-lipid structure, in combination with linoleic acid), Cholesterol, Aloe Vera, Soy, and 1% Lactic Acid. This product DOES NOT CONTAIN PARABENS. Apply a small amount evenly over affected area twice a day (morning and evening). Average healing time is 1 to 3 months, continue treatment until scar stops improving.